One awesome night of music to cap off the greatness of 2012! 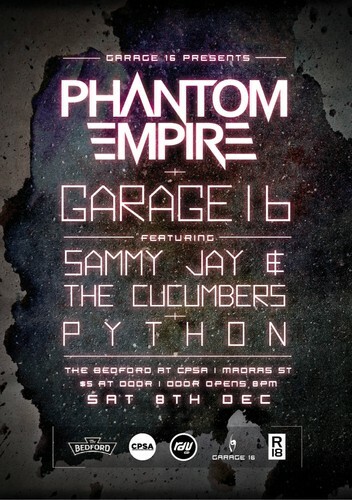 Four wicked bands: Python, Sammy Jay and The Cucumbers, Garage 16 and Phantom Empire. This is the event to turn up to, the best chance to let loose and party before settling into preparation mode for Christmas and New Year's. It's guaranteed to be huge with massive prizes to be won! So why would you even consider going to the usual pubs and bars around Christchurch with over-priced drinks and mediocre music? Party hard, rock your face off, and feel great as you help raise money for a charity that is yet to be confirmed. More details to come, as something this huge is constantly growing.